Nowadays cellular phone usage has become so common especially in young and middle-age generation. With the increase complexity of cell phone features, it may no longer suitable for senior citizens. Some may not need those fancy features and others may not know how to operate on it. 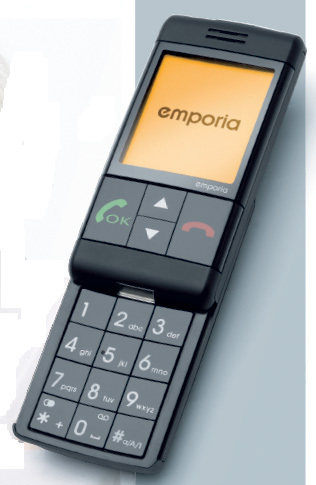 In viewing of this, Emporia has introduced a series of basic cellular phones targeted for these minority groups. Basically, an old folk needs a phone that has very simple features, treating it as very basic communication device that helps to keep close contact with his family and friends. Emporia, an Austrian cell phone manufacturer understands well on the requirement. As we expected, the cellular phones has a huge monochrome display, big font on the screen, big keypad (all got to be big!). On the front panel, the default menu is a contact list that enables users to make calls directly. This would save them some hassles to scroll through to the right menu. On top of that, it is also equipped with emergency call key function. This feature is ideal for old folks during emergency use. If the cost is not a concern, it could be good idea to consider putting in a feature called network-based locator system, so that their actual locations could easily been tracked back in any critical situation with the help of service provider. So, thinking of buying something for your grandpa as a birthday gift? This would be a great choice!